Is your bottle of sunscreen hidden in the back of the closet, jumbled in among the swimsuits and towels, only to be unearthed for beach days? If so, it’s time to bring it out into the light. Sunscreen is an effective protective agent against damage from the sun’s powerful rays for all ages, genders, and skin types. Regular application lessens the chance of developing skin cancer in adulthood. And sunscreen is even more powerful when combined with other methods of skin protection: seek shade during the brightest time of the day (between 10:00 am – 4:00 pm), wear protective clothing such as long-sleeved shirts and hats, and invest in sunglasses that block UV rays. In its most crucial role, sunscreen protects your skin from the sun’s harmful ultraviolet rays, which come in two forms – UVA and UVB rays. UVA rays are most commonly associated with skin aging; these beams cause fine lines, wrinkles, and age spots that make skin look prematurely older. UVA rays have the ability to pass through glass, meaning your skin is exposed to them while you are driving and standing or sitting in front of windows with the blinds open. UVB rays are the ones most commonly associated with sunburns. Unlike UVA rays, UVB beams cannot pass through glass. Both UVA and UVB rays are carcinogens (cancer-causing), which is why you should invest in a sunscreen that offers broad-spectrum protection against both types. Even if you have darker skin or tan rather than burn, skin cancer is non-discriminatory and can be diagnosed for any age, gender, or skin type. Sunscreen keeps your skin healthier in other ways as well. It protects sensitive skin against sunburn and it reduces the appearance of sun damage – discolorations and dark spots, sagging or leathery skin, and wrinkles. These protections help your skin maintain a more even skin tone overall. Wear sunscreen on every occasion you will be spending time outside. Even on cloudy days, 80% of ultraviolet rays can penetrate cloud coverage. Keep in mind that snow, sand, and water all reflect UV rays, which makes them more potent when they hit your skin. The American Academy of Dermatology recommends purchasing a sunscreen that is broad spectrum, SPF 30 or higher, and waterproof. A sunscreen’s SPF (sun protection factor) determines the percentage of UV rays it will block. SPF 30 will provide more than adequate coverage – it blocks up to 96% of the sun’s rays, and protection only increases minimally with higher SPFs. Apply 1.0 ounce (enough to fill a shot glass) to all exposed areas of your skin 15 – 30 minutes before going outside. Don’t skip your scalp, ears, and feet, which are all susceptible to both sunburn and skin cancer. Reapply every two hours or after perspiring or swimming. Even if you are wearing a waterproof sunscreen, it needs to be reapplied regularly. Throw out and replace sunscreen per its expiration date or if you notice changes in its color and/or consistency. 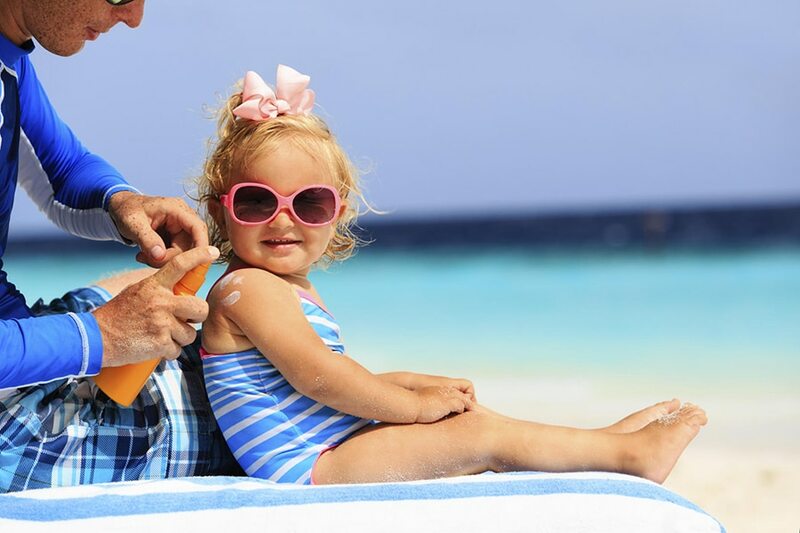 Sunscreen is regulated by the FDA as an over-the-counter drug and labels now provide important protection information, such as the spectrum of coverage, the SPF, the amount of water resistance, and whether the product will block skin cancer and/or skin aging. Whether you use a lotion, stick, or spray, choose a product that will be easy for you to use and re-use often. For ladies, consider investing in cosmetic products that include sunscreen. And if you are looking for a product that will not irritate sensitive skin, read here to learn more about sunscreen’s key ingredients and which ones you should avoid. If you believe you may have a skin cancer growth, don’t wait – contact our wonderful team here at Florida Dermatology and Skin Cancer Centers today to schedule a consultation.